Mrs. Janice McKenley joined Victoria Mutual in July, 2007 as Senior Vice President & Group Chief Financial Officer. She is responsible for the Society’s Treasury and group shared services inclusive of Finance, Information Security, Fraud Investigations, Risk Management and Internal Audit. Presently, she is the Executive Sponsor of the System Upgrade project scheduled to be implemented in May 2017. Prior to joining Victoria Mutual, Mrs. McKenley held the position of General Manger, Financial Control Division at the National Commercial Bank Ltd. In that role, she had responsibility for the transformation and reorganization of the division, improvement in the financial reporting timeframes; Budget preparation and Regulatory Reporting; as well as coordination of the external audit and financial reporting for the Bank and Group. Mrs. McKenley has a wealth of experience including Computerized Information System Risk Management (CISRM), which was her specialty during her tenure at McKenley& Associates and PriceWaterhouseCoopers. Mrs. McKenley was also instrumental in formulating the corporate direction and strategic goals for the City of Kingston Co-operative Credit Union, while serving as Deputy General Manager, Finance & Corporate Planning. Mrs. McKenley, a Chartered Accountant by profession, holds an MBA in Finance and a B.Sc. in Computer Science from the University of the West Indies. 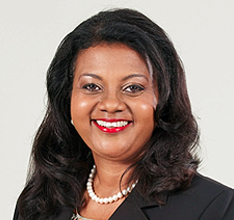 She is a Fellow of The Chartered Association of Certified Accountants (UK) and The Institute of Chartered Accountants of Jamaica of which she is a past council member and member of the Accounting Standards Committee.